How to find out what breed your dog is? There is a variety of reasons you want to know the breed of your pet. In fact, you can find your rescue dog is purebred. Your dog also may be a mix of many different breeds. Let’s check out this post, we will help you learn how to determine your dog’s breed. In order to determine your dog’s breed, you can figure it out through their appearance. In addition, you can have to go to the experts to know if your dog suffers from any health issues based on their breed. It’s more useful to rely on expert assistance, documentary evidence, and scientific analysis. Most purebred owners know their prized pup’s pedigree. But, they may sometimes forget it. You can check for more information if you have a purebred dog. In fact, your vet comes with a lot of experience with many different breeds. That’s why they can give you some valuable insights into your dog’s background. Ask your vet’s opinion about your dog’s breed. In addition, you can also ask a groomer about your dog’s breed. You will have DNA testing kits for dogs from several companies thanks to a quick online search. This can also determine the present breed in your canine. But, all home tests are not created equal. You can save money thanks to a less expensive test, but it offers a smaller database for less accurate information. When it comes to this route, you will have several options varying by precision, price, and complexity as well. You can find tests ranging from $60 available online as well as in many pet supply stores. If you want to swab your dog’s cheek, it’s important to check to make sure your dog’s cheek and gums are not stuck by food or debris. This is considered as the most scientific and accurate way you should use to determine your mutt’s breed profile. If an expert just looks over the animal in order to identify a dog’s breed, the result may not be accurate. In fact, identifying a predominant breed may make you take about 27% of the time. Identification by visual appearance is one of the most popular methods for pet owners who want to satisfy a general curiosity. Most importantly, this method is free. We recommend you to make a list of your dog’s distinguishing features not only most prominent but also least prominent. Of course, this way helps you narrow your search for likely breed. For a pet scale, you need to weight your dog. In addition, you can weight your dog at any veterinary office. Consider any defining characteristics you notice. If you get a puppy to your home, it’s important to wait until it is fully mature. And, all characteristics will become apparent. You should think about the build of your dog. By this way, you can narrow down the breed group. For example, if you have aslender dog with long legs, you may own a herding dog. This means you should look at your dog’s snout, back, tail, skull, legs, as well as any distinctive elements. There are some dogs that have round skulls as well as very short snouts such as Pugs and Bulldogs. But, some have narrow skulls and long snouts such as Collies and Greyhounds. Some breeds short legs have long backs, and three different types of fur-coat. But, other breeds have just one type of furs such as the American Eskimo breed and the Chinese Shar-Pei breed. There are a lot of types of dog fur. Rottweilers have mahogany fur and short black. They come with specific markings on the head and chest as well. Many terriers come with wiry coats with stocky bodies such as the Miniature Schnauzer, the Cairn Terrier, and the Jack Russell terrier. Last, Poodles come with the distinction of having curly coats in many sizes and colors. Determine the color of your dog’s fur. Also, learn about if there is a pattern to the coat color. 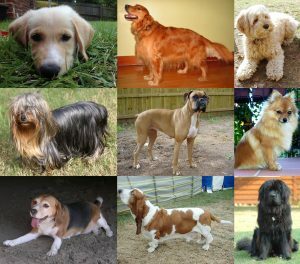 Some breeds actually only have one or a few colors or patterns. So, they help to narrow the possibilities. For instance, German Shorthair Pointer dogs have liver and white while Vizslas come in a solid copper color. It’s hard to make a completely accurate determination of your dog’s breed. But, you can eliminate many possibilities thanks to the help of one or more dog breed description guides. Your dog is actually a mix of several different breeds.